(A) The Federation of Primary Schools Gaelic Games shall be known as âCumann na mBunscolâ. The National logo of âCumann na mBunscolâ shall be Theâ Cumann na mBunscolâ logoâ. All business pertaining to âCumann na mBunscolâ shall be carried out under this name and/or under the â Cumann na mBunscolâ â logoâ. (B) Schools with GAA affiliations in other countries may be accepted as associate members on application to the National Committee and subsequent approval. (1) To promote and foster our national games, Boysâ Football, Girlsâ Football; Hurling; Camogie; Handball and Rounders, Athletics and cultural activities in all the Primary Schools of Ireland and other affiliated areas, in line with National Policy of Cumann na mBunscol and Cumann LÃºthchleas Gael. (2) To promote and foster a positive attitude towards our national games among teachers, pupils, parents and all involved in the promotion of Gaelic Games in the primary education system. (3) To promote Gaelic Games in an atmosphere of fun and enjoyment and to make Gaelic Games the games of choice in our primary schools whilst emphasising participation for all. (1) To provide a means for the expression of the collective opinion of its members on matters affecting the interests of Gaelic Games in the Primary Schools of Ireland and other affiliated areas. To this end Cumann na mBunscol shall endeavour to align ourselves to Cumann LÃºthchleas Gael, its policies and national programmes. (2) To provide a means whereby talks and negotiations can take place with the relevant Departments of Education and other bodies to promote the aims and interests of âCumann na mBunscolâ. a. Preparing and submitting an annual budget. b. Raising sponsorship and other finances nationally to help with the overall promotion of the games. c. Using the Cumann na mBunscol logo in franchising arrangements with business and industry to help raise funds. 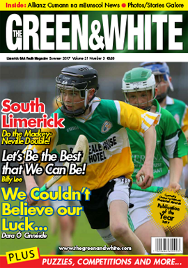 (4) To provide advice to members on the best ways of promoting Gaelic Games in Primary Schools. (a) Coaching (b) Seminars (c) Publications. (6) To identify weaknesses with the co-operation of County Coisti, Provincial Councils and other relevant bodies and endeavour to rectify them. (7) (a) To organise and administer a National Skills Programme (Mini-Sevens) in Boysâ and Girlsâ Football, Hurling and Camogie, culminating in Croke Park on All-Ireland Semi-Final and Final days. (b) To organise a National Skills programme in individual schools in Hurling and Camogie. (8) To organise and administer National Handball skills programmes, culminating in a National Handball Skills Exhibition in a suitable venue. (9) To operate and maintain an insurance policy so that cover can be provided for officers and members of committees of âCumann na mBunscolâ while organising and promoting the games/activities. To promote Gaelic Games in an atmosphere of fun and enjoyment and to make Gaelic Games the games of choice in our primary schools. (a) The A.G.M. shall be the supreme governing body of the organisation but shall not be involved in the running of local units. (b) The AGM shall be held in the month of February or March at a suitable venue chosen by the National Officers. (d) The hosting of the AGM shall rotate between the four provinces. N.B. In the event of a Province not being represented on An Coiste NÃ¡isiÃºnta a provincial delegate can be elected at the AGM. N.B. 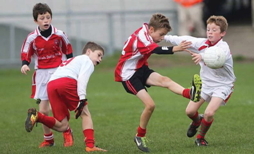 Every third year the Annual General Meeting will consider a review presented to it by a sub-committee of Cumann na mBunscol on the organisation of the âMini-Sevensâ. Proposed changes will be voted in and if successful, will come into effect for the following years âMini-Sevensâ. 1. A special General Meeting may be called by An Coiste NÃ¡isiÃºnta or by the special written request of 12 or more County/Provincial Coisti stating the reason for such a meeting. 2. (a) On the receipt of 12 or more written requests for a Special General Meeting, the National Secretary must inform the Chairman who will call a meeting within 14 days. (c) Two delegates from each Provincial Council. (d) Two delegates from each affiliated area (non-voting). 4. Business of Special General Meeting. The only business that will be discussed at the meeting is the business requested as the reason for calling the meeting. 1. All members of the National Committee shall be elected annually at the AGM. All officers may hold office for a maximum period of five years. 2. All members of the National Committee are limited to two consecutive maximum terms of office, but not in the same office. A member may however seek office again after a minimum of one yearâs break. 3. The National Committee shall carry out the business of Cumann na mBunscol between Annual General Meetings. They shall meet regularly and attend to all current business. 4. The National Committee may appoint subcommittees as required to assist them with a current task or problem. 5. The National Committee may accept units from other countries on approval of application for associate membership of Cumann na mBunscol. 6. The Cathaoirleach shall see that the rules of the organisation are enforced sensibly and fairly on all occasions. 7. In an event of the enforced absence of the Cathaoirleach, the Leas-Chathaoirleach shall preside over the meetings and act in all cases as Cathaoirleach. 8. All sub-committees set up by the National Committee will be chaired by another member other than the Cathaoirleach and Leas-Chathaoirleach. 9. The Assistant Secretary shall minute all meetings and ensure that a copy of the minutes be available for the next meeting. 10. All routine correspondence with affiliated areas shall be done by the Secretary. 11. All correspondence with the GAA, State Departments and Public Bodies shall be carried out by the Secretary in consultation with the other bodies. (i) The maintenance of proper financial records. (ii) An annual audit of the accounts. (a) Take every available opportunity to publicise the work of Cumann na mBunscol and to ensure that Gaelic games are promoted as the games of choice in our primary schools. (b) Ensure that the âAims and Objectivesâ of Cumann na mBunscol be protected and advanced in dealing with outside agencies. (c) Prepare all National Press Releases on behalf of An Coiste Naisiunta, Cumann na mBunscol. (a) Endeavour to raise standards in all counties by holding seminars, coaching courses, issue publications and liase with relevant bodies in pursuit of this objective. (b) Identify weaknesses and with the help of County Coisti, Provincial Councils and other relevant bodies seek to rectify them. 15. The delegate to Central Council will in consultation with the other officers promote the interests of Cumann na mBunscol at Central Council and endeavour to promote Primary School games at all times. N.B. Every third year the Annual General Meeting will consider a review presented to it by a sub-committee of Cumann na mBunscol on the organisation of theâMini-Sevensâ. Proposed changes will be voted in and if successful, will come into effect for the following years âMini-Sevensâ. 11. All correspondence with the GAA, State Departments and Public Bodies shall be carried out by the Secretary in consultation with the other bodies. Committee shall be the President, Assistant Secretary and if necessary Provincial delegates. 17. A Provincial Delegate will be a full member of the National Committee with full voting rights. 1. Provincial Councils shall be properly constituted under the aims and objectives of âCumann na mBunscolâ. 2. An Annual General Meeting of each Provincial Council will be held annually. This AGM is to be attended by the President of Cumann na mBunscol or his/her nominee from An Coiste NÃ¡isiÃºnta. 3. The Provincial Secretary must inform the National Secretary of the venue and date of the Provincial AGM. (a) Provincial Councils shall meet at least three times annually. (b) The Provincial AGM is to be held before the National AGM. 4. Those entitled to vote at this meeting shall be the elected provincial officers and two delegates from each county. 5. Those entitled to speak at this meeting shall be the elected officers and either of the two delegates from each County. 6. Invited guests may speak at the invitation of the Provincial Council. 7. Delegates must attend a minimum of two out of three meetings. 9. The Minutes of the Provincial AGM must be sent to the National Secretary within a month of the Provincial AGM. 10. The annual financial statement must be sent to the National Treasurer within a month of the Provincial AGM. 11. Failure to send either the minutes or annual financial statement within a month of the Provincial AGM shall result in sanctions. 12. This committee shall promote the aims of Cumann na mBunscol and endeavour to raise the standards of Gaelic Games within the Province. 13. Each Provincial Council will liaise with An Coiste Naisiunta and the Provincial Councils of the GAA and other relevant bodies and endeavour to generate funds for the promotion and development of Cumann na mBunscol activities in that Province. 14. Two delegates from each Provincial Council will attend the Annual General Meeting and Special Meetings of Cumann na mBunscol. 15. An annual written report shall be presented to An Coiste NÃ¡isiÃºnta. (iii) Presentation of accounts to the Annual General Meeting. 17. Each Provincial Committe will notify and invite a delegate from An Coiste Naisiunta to the Provincial AGM, in the absence of the National President. 18. Provincial status is to be granted to GB. 1. Each County Schools Committee shall be properly constituted under the aims and objectives of Cumann na mBunscol. 2. A General Meeting of each County Schools Committee will be held annually. Each County Schools Committee must meet at least three times annually, including the AGM. 3. All Primary Schools in the County will be sent written notification of that meeting. 4. Elections will be held at this meeting and Officers and a Committee will be appointed to run the affairs of Cumann na mBunscol in that affiliated area between meetings. 5. This committee shall promote the aims and objectives of Cumann na mBunscol and endeavour to raise the standards of Gaelic Games in their County in line with National Policy. 6. This Committee shall adjudicate on all activities of Cumann na mBunscol within the County. 7. Decisions of Cumann na mBunscol may be appealed to âAn Coiste GearÃ¡nâ within the County. The decision of An Coiste GearÃ¡n will be final. (a) An Coiste GearÃ¡n should be elected at the AGM. Members of âAn Coiste GearÃ¡nâ should not be officers or members of the Committee within the County. 9. A statement of Accounts must be forwarded to the National Treasurer annually. 10. Two delegates from each County will attend the Annual General Meeting and Special Meetings of Cumann na mBunscol. 11. Each county shall formally adopt a constitution, a copy of which shall be forwarded to An Coiste NÃ¡isiÃºnta for ratification. GAA Code of Practice in Youth Sport or DES / DENI guidelines on Child Protection. 13. When affiliating to Cumann na mBunscol annually, teachers and B.O.M./B.O.G. agree to be bound by the rules of Cumann na mBunscol. 14. County committees shall accept correspondence only from the school through the Chairperson, the principal or the designated teacher. 1. A Standing Orders sub-committee comprising of the Provincial Chairmen and Secretaries or their reps shall consider all motions and nominations and decide if they are in order and acceptable for presentation at the AGM. 2. The Cathaoirleach shall preside over all meetings and shall see that the rules of the organisation be enforced sensibly and fairly on all occasions. 3. Motions to the Annual General Meeting, which shall be in the name of County CoistÃ­, Provincial Council or An Coiste NÃ¡isiÃºnta and formally adopted at a meeting of that body, must reach the National Secretary not later than four weeks before the AGM. 4. All nominations for positions on the National Committee which shall be in the name of an affiliated area or Provincial Council and formally adopted at a meeting of that body, must reach the National Secretary not later than three weeks before the AGM. 5. Copies of the agenda for the AGM together with list of motions and nominations for elections to National Committee shall be circulated to all affiliated areas and Provincial Councils at least 7 days before the AGM. 6. Amendments and agenda will be with the National Secretary in writing in the name of an affiliated area or Provincial Council at least one hour before the AGM. 7. Contrary motions shall not be accepted. 8. All motions must be clear and unambiguous and must not conflict with the aims and objectives of Cumann na mBunscol. 9. (a) To be deemed in order a motion must be implementable and must be specific to Cumann na mBunscol. (b) However motions may call on Cumann na mBunscol to negotiate with relevant bodies on a specific matter that is of interest to Cumann na mBunscol. 10. The mover of a proposal shall speak for not more than two minutes. 11. The seconder of a proposal shall speak for no more than two minutes. 12. No motion shall be discussed for more than 20 minutes. The motion must be disposed of when the 20 minutes have elapsed. No speaker shall speak for more than two minutes. 13. Each delegate shall register and each speaker shall identify themselves, name and unit. 14. The mover shall have the right of reply in all cases. 2 minutes maximum. 15. Voting shall be by a show of hands on all motions. A simple majority shall ensure the adoption of any item. Where rule changes are proposed, a two thirds majority shall be necessary in every instance to ensure their adoption. 16. The usual method for the disposal of amendments and agenda shall be followed. 17. In the event of the proposition âThat the question be put", and this proposition be seconded, the presiding Cathaoirleach shall on a show of hands either continue the debate or âPut the questionâ. 18. In the event of the proposition âThat the AGM, move to next business â and that this proposition be seconded, the presiding Cathaoirleach shall put the proposition to a vote immediately. If defeated the debate shall be resumed. 19. If a position on the National Committee be contested, voting shall be by secret ballot. A successful candidate must have 50% + 1 of the valid votes cast by delegates present and voting at the AGM. In the event of a tie, the winning candidate will be drawn by lot. 20. The Cathaoirleach may at his/her discretion ask if there is no obvious objection to a motion that the motion be put in order, to save time. 21. The Cathaoirleach may at his/her discretion and in consultation with order officers change the order of business in the interest of efficiency. 22. The order of business may also be changed at the request of a majority of delegates present and voting. 23. Only properly constituted delegates may speak at the AGM. 24. Other speakers may only address the AGM when prior arrangements are made through the National Committee. 1. Grievances and complaints in regard of matters within an area will be settled within that area. 2. Each County will have a constitutionally elected Coiste GearÃ¡n to deal with appeals arising from decisions of the County Coiste. 3. Complaints, Objections and Counter Objections: Any complaints or objections must be lodged with the RunaÃ­ Chontae in writing within 3 days of the game. The RunaÃ­ informs the other party who also has 3 days to respond in writing. The matter can then be dealt with by the Coiste Chontae. The decision will then be conveyed to both parties. Any party dissatisfied with the decision of the Coiste may appeal in writing to the RunaÃ­ Chontae Cumann na mBunscol within 3 days. This appeal will be heard by the Coiste GearÃ¡n. This is an appeals body. A minimum of 5 are elected to this committee at the A.G.M. No member of the Officer Board of Coiste Chontae, Cumann na mBunscol or anybody who has heard the original objection may sit on An Coiste GearÃ¡n. No member of the Coiste GearÃ¡n may consider any appeal involving their own school. The Coiste GearÃ¡n may call all interested parties. A quorum of 3 is necessary to hear all appeals. The decision of the Coiste GearÃ¡n is final and binding. (a) Grievances, complaints and objections dealing with issues outside County Jurisdiction will be dealt with by the National Committee and that decision will be final. 5. Sanctions will be taken against any Coiste, National, Provincial or County or any member for the following reasons: bringing the organisation into disrepute, or failure to implement National Policy. 1. Misuse of organisational funds. Automatic Disassociation. 2. Conduct unbecoming a member of âCumann na mBunscolâ. Automatic Disassociation. 3. Failure of a County to furnish a statement of accounts. Withholding of grants and tickets. 4. Failure of a County to furnish a secretaryâs report. Withholding of grants and tickets. 5. Failure to hold an A.G.M. plus relevant meetings and two additional meetings. Withholding of all monies and tickets due to that County / Provincial Coiste. 6. Failure of County / Provincial units to honour obligations to sponsorship agreements.Witholding of sponsorship monies. 7. Failure to comply with/implement the Constitution. Witholding of grants and other benefits. 8. Failure to comply with/implement National Policy. Witholding of grants and other benefits.